New Hampshire is covered in large expanses of untouched wilderness. The White Mountains in the north cover more than a quarter of the state, and most of New Hampshire’s 48 peaks over 4,000 feet high are in the White Mountains. Manchester is home to the Fisher Cats Minor League Baseball Team, the Frank Lloyd Wright-designed Zimmerman House, and other great attractions. 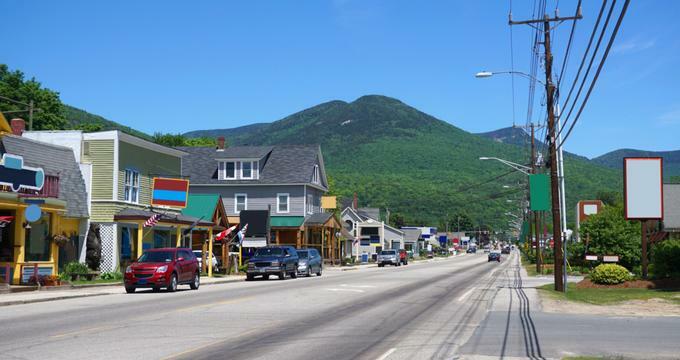 Very popular with tourists, North Conway is a great starting point for skiing, hiking, taking a tour of the magnificent White Mountains and, if you so desire, looking for moose. New Hampshire only has a small stretch of Atlantic coastline, but it is fortunate to have a large number of beautiful sandy beaches. Whether New Hampshire’s allure is its 18 miles of stunning coastline or the wilderness of the Great North Woods, there are plenty of reasons for couples to tie the knot in the Granite State. Lincoln, New Hampshire, is a small town in the state’s White Mountains area. Visitors come here mainly to enjoy the beautiful natural landscapes surrounding the town. Even though the state of New Hampshire has one of the shortest coastlines of any state that isn’t landlocked, New Hampshire certainly makes good use of what little coastline it does have. It’s no surprise, therefore, that Portsmouth has become such a popular summer resort town over the years and attracts good numbers of visitors on an annual basis. Even as the years go by and new advancements in technology change the way we live, these traditional pastimes stand the test of time and remain beloved from one generation to the next. The prominence of Mt Washington is 6,148 feet (1,874 m), while the elevation of Mt Washington is 6,288.2 feet (1,916.6 m). 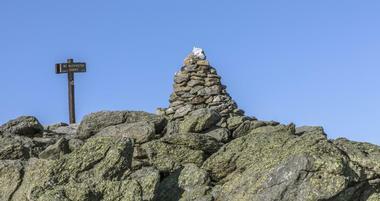 It's the highest point in the state of New Hampshire. New Hampshire is a U.S. state in New England famous for is charming historic towns and spectacular wilderness. While the cities and towns proudly preserve their historic heritage and beautiful architecture, the natural beauty is protected by a large number of parks and national forests, such as Franconia Notch State Park and Echo Lake State Park. 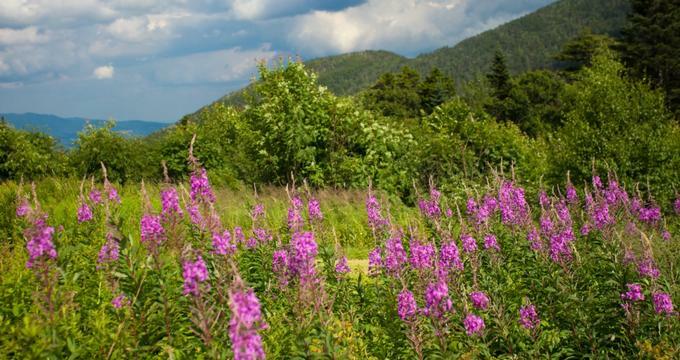 The White Mountain National Forest protects a vast area from too much development. Strolling through Portsmouth’s Market Square is a delight, with the 1855 North Church and the Strawbery Banke Museum, a living indoor and outdoor museum. 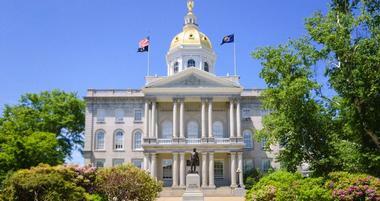 The capital Concord is dominated by the 1819 State House with its golden dome. Hanover is a lively college town with renowned Dartmouth College, while Plymouth is perched high up in the White Mountains. Portsmouth is a small New Hampshire city on the banks of the Piscataqua River. It is one of the oldest cities in the country. It was settled in 1623, and many of the lovely well-preserved 17th and 18th-century homes can be seen in the charming downtown. Start your exploration at the Market Square and observe the imposing 1855 North Church. Visit the Strawbery Banke Museum, a 10-acre outdoor living history museum with docents dressed in period costumes telling the story of the city and its past. Stroll along the flower-lined paths of Prescott Park and enjoy the gardens and live performances, or launch your boat into the river at the boat docks. Take the kids to see the USS Albacore, a former research submarine, in a park next to a visitor center or let them splash around at the Water Country aquatic playground. The White Mountain National Forest covers 800,000 acres of land in the White Mountains, divided between New Hampshire and Maine. The forest includes several mountain ranges, such as the Presidential Range and Mount Washington's 6,288-foot summit, the highest mountain peak in New England. There are six designated wilderness areas in the forest. Over 60% of the forest is used mainly for non-mechanical recreation while the remaining 40 % includes downhill ski areas, logging, and other more developed uses. There are 184 species of birds in the forest as well as a large number of mammals such as bob cats, black bears, coyotes, gray foxes, moose, and others. If you are lucky, you can see them while hiking along one of many trails, such as the White Mountain Trail. The Kancamagus Scenic Byway offers a more comfortable visit. The forest is particularly popular for a visit during the fall, when the foliage puts on quite a show. The capital city of New Hampshire, Concord is a modern city with the downtown landscape dominated by the golden dome of the 1819 State House. Not far away is the Capitol Center for the Arts, where you can enjoy theatre, music, or dance. Kids love the McAuliffe-Shepard Discovery Center, an interactive science museum with a number of space-themed exhibits and a large planetarium. If you like birds, stroll through the Susan N. McLane Audubon Center. 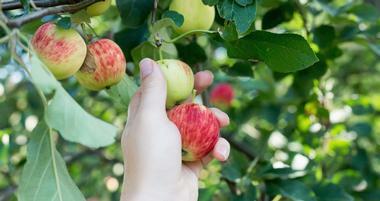 Canterbury Shaker Village is a history museum and a historic site founded by a number of Shaker settlers. Pierce Manse, today a house museum in the city’s historic district, was once the home of US President Franklin Pierce. Great Bay National Wildlife Refuge is located along the shore of Great Bay, and Chuckster's is a fun park with go-karts, mini golf, and a climbing wall. 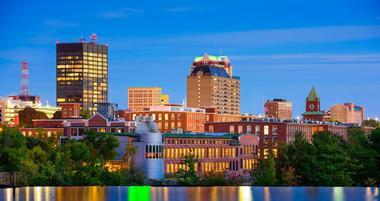 Nashua is a southern New Hampshire city on the banks of the Nashua River with a huge number of parks. At the center of the city, on the river, is 325-acre Mine Falls Park, which stretches along the river bank, perfect for a stroll in the shade of the large trees. Greeley and Benson Parks both feature kids’ playgrounds and picnic areas. Nearby Holman Stadium is home to the local collegiate summer baseball league team. Symphony NH is also located in Nashua, performing music works in different venues around town. FunWorld is a popular kids’ indoor entertainment center with a roller coaster, rides, and arcade games. Abbot House is a historic 1804 house museum located at One Abbot Square. Manchester is a city on the Merrimack River in southern New Hampshire famous for the magnificent Amoskeag Falls and the renowned Currier Museum of Art, containing a number of major works by American and European artists. The museum is also in charge of the Zimmerman House, one of the outstanding designs by Frank Lloyd Wright. The Millyard Museum, located in an old fabric mill, describes the history of Manchester and how the Amoskeag Falls influenced the development of the city and the local textile industry. Derryfield Park, located downtown, has a network of hiking trails through the lush greenery, leading to the historic 19th-century Weston Observatory. The SEE Science Center is a kids’ favorite, with interactive hands-on exhibits. Another great place for the kids is Charmingfare Farm, with a petting zoo, pony rides and all sorts of seasonal activities. Nearby Massabesic Lake is a great place to cool off on a hot summer’s day or throw a line to try and catch a fish for dinner. Hanover is a small yet lively college town on the Connecticut River, famous for the highly renowned Dartmouth College, on the slopes of Moose Mountain, rich in history and with great skiing. Nearby 1,158-acre Mascoma Lake has a lovely beach and is a popular fishing destination. Dartmouth Skiway is a DCAD Dartmouth College ski resort, and the Hopkins Center for the Arts, also located at Dartmouth College, is the college’s cultural hub. It was designed by Wallace K. Harrison, who also designed Manhattan's Lincoln Center. The Hood Museum of Art is renowned art gallery with a collection of 65,000 art pieces, including Native American, African, and African-American art. The Montshire Museum of Science is an interactive hands-on indoor and outdoor science museum with a number of exhibits, a large aquarium, and a park with hiking trails. Keene is a modern New Hampshire city on the Ashuelot River in Cheshire County known for its two large colleges – Keene State College and Antioch University New England. The city is sited on an ancient dry lake bed and is surrounded by rolling green hills and lush fertile meadows. Just outside Keene is the popular Granite Gorge Ski Area, with a ski resort and a number of well-maintained ski trails. 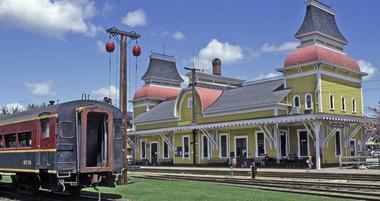 The Horatio Colony Museum offers exhibits that tell the story of the city’s past. Otter Brook is a 13.2-mile-long river surrounded by a park and a small lake. Cheshire Children's Museum is a fun place for kids to engage their imagination while learning. Surry Mountain Lake is a 353-acre lake created by impounding the Ashuelot River. The Slate Covered Bridge is one of many historic covered bridges in the area. Salem is a town in Rockingham County, north of Boston, with a long history as a tourist destination. Its major tourist attraction is large Canobie Lake Park, established in 1902 by the Massachusetts Northeast Street Railway Company. The company’s intent was to encourage leisure excursions to the lake and the use of its trolleys. The lovely park offers pleasant strolling along its tree-lined promenades, along the lake, or between colorful flower beds. While rides and arcades are very different from those of the early 20th century, and the dance hall is now gone, the park is still very popular. Rockingham Park Race Track, the oldest horse race track in New England, adds to the attraction of Salem, as does "America's Stonehenge," a curious archaeological site with a number of large stone structures and rocks of unknown origin. Searles Castle, completed in 1915, is a replica of an English medieval Tudor manor and is listed on the National Register of Historic Places. Dover is a city located in the coastal area of New Hampshire, settled in 1623, and with a long and colorful history. The Woodman Institute Museum is a great place to learn about the area’s past, culture, and arts. The Great Bay National Wildlife Refuge has a network of hiking trails that run through the park’s wetlands and woods. It is a great place to see native birds such as osprey and American kestrels as well as other wildlife. The Children's Museum of New Hampshire is a kids’ educational center where fun and education go hand in hand, while kids are exploring science, art, and culture. Myrtle Street Gallery is a street art show that takes over the streets of Dover for two days in August. The County Farm Bridge is an old covered bridge over the Cocheco River, one of the few in the area. Rochester is a city on the Cocheco River in the coastal area of New Hampshire, about an hour from Boston and one hour from the White Mountains. Rochester was developed as a mill town, with the Cocheco River providing power for six tanneries, a sawmill, two gristmills, and a fulling mill. The 19th-century prosperous mill era is still visible in the fine architecture in the city’s historic district, such as the Rochester Public Library, which was originally a Carnegie Library and was constructed in the Georgian revival style out of granite and brick. Other noted historic buildings are the 1908 Rochester City Hall and the famous George G. Adams’ Opera House, which still has the original 90-year old decor. Near the city is the beautiful Blue Job Mountain, a very popular hiking area with an historic fire tower at its summit. Plymouth is a New Hampshire town in the White Mountains at the convergence of the Baker and Pemigewasset rivers. The highest point is Plymouth Mountain at 2,193 feet. The mountain is famous for its ski and hiking trails. The historic town center, or the Common, has a number of notable buildings, such as Plymouth Post Office, Plymouth Congregational Church, Rounds Hall of Plymouth State University, and the town hall. Plymouth State University is the center of the city’s cultural life, while the Plymouth Historical Museum preserves the town’s history. The town has two public libraries and one of only two Boy Scout Fountains in the country, located on the Common. The historic Plymouth Theater is today the Flying Monkey Movie House and Performance Center. Smith Millennium Bridge is one of several historic covered bridges crossing the Baker River. While Derry is known as a Spacetown because the first American astronaut Alan Shepard was born here, its fame is much older, since it was also the home town of the famous poet Robert Frost. The Robert Frost Farm is today a state park and a National Historic Landmark and is used for poetry readings and other public events. The town, first settled in 1719 by Scots-Irish families, has an excellent history museum, the Derry Historical Society & Museum, with a rich collection of historic artifacts. Pinkerton Academy, established in 1814, is America's oldest private school. The Adams Memorial Opera House is located in the Adams Memorial Building, also known as the Derry Opera House. This historic building was constructed in 1904 in a surprisingly sophisticated Colonial Revival style for such a small town. The lush 71-acre Ballard State Forest is the location of the Taylor Mill State Historic Site, with a nicely reconstructed sawmill. Franconia Notch State Park is one of several parks in the White Mountains in northern New Hampshire. Franconia Notch is a famous and much-used mountain pass between the Franconia Kinsman ranges. This very popular park has a number of interesting attractions: Echo Lake, Profile Lake, Flume Gorge, the historic site Old Man of the Mountain, and a network of hiking trails of all levels of difficulty. Cannon Mountain is a popular 1930 ski resort. There is an old cannon on the mountain summit, which gave it its name. Old Man of the Mountain was a protruding mountain formation that collapsed in 2003. For those who are not into mountain hiking or climbing, there is an aerial tram that goes to the summit. Echo Lake State Park, at the foothills of White Horse Ledge, was developed to protect beautiful Echo Lake near the town of North Conway. The lake is a popular recreation destination with a bathhouse, a nice swimming area, and several picnic tables. There is a mile-long road that takes drivers to the 700-foot high Cathedral Ledge and a scenic hiking trail running to the White Horse Ledge and Cathedral Ledge. Both have easy gradual slopes on their western flanks. The east side features sheer, almost vertical rock drops scraped bare of vegetation by glaciers, a perfect challenge for experienced rock climbers. The tops of the two ledges offer spectacular views of the White Mountains across the Saco River Valley. Flume Gorge is located in Franconia Notch State Park, New Hampshire, at the foothills of Mount Liberty. The scenic gorge extends horizontally for 800 feet. Flume Brook cuts through the gorge and its vertical walls consist of Conway granite, rising up to 90 feet from the bottom and up to 20 feet apart. A trip into the gorge starts at the Flume Visitors Center. The walk involves a lot of uphill walking and stair climbing. There is also a 2-mile loop trail offering a self-guided tour of the gorge, passing by a natural pool, a covered bridge, waterfalls, and small caves that kids love to explore. The boardwalk allows visitors to stop and enjoy the ferns and flowers growing on the sheer rock. The visitors center is located on a very nice spot offering wonderful views of Mount Liberty and Mount Flume. Hampton Beach State Park is located on the southeastern end of New Hampshire on a narrow peninsula where the Hampton River enters the Atlantic Ocean. This 50-acre park in Hampton Beach, New Hampshire, is located next to the Hampton Beach Bridge. Its soft white sand beach attracts large number of visitors on warm days and has all the amenities such as playgrounds, lifeguards, a pavilion, an amphitheater, and an RV campground. The park is particularly interesting at low tide, when the receding water traps sea urchins and other small animals in tide pools. The swimming on the beach is excellent, as are fishing and picnicking. The Lost River Gorge and Boulder Caves are located in the White Mountains, New Hampshire. Lost River got its name from the brook that runs through the Kinsman Notch mountain pass until it disappears into the steep, narrow glacial gorge. The gorge is filled in places with massive granite blocks, covered in debris that has fallen over the millennia, creating caves. The brook cascades through and over them along its underground course until it emerges on the surface and spills into the Pemigewasset River south of Franconia Notch. There is a ¾-mile boardwalk that runs through the gorge, which makes exploration easier. But, if you prefer a challenge, you can get off the boardwalk and explore the surrounding Boulder Caves. There is a range of fascinating caves to explore as well as a fantastic 35-foot waterfall known as Paradise Falls. Two sisters, Josie and Sarah Prescott, who were public school teachers, used their inheritance to purchase and then clear a number of properties along the Piscataqua River, which were, at the time, located in a seedy, run-down industrial part of town. The goal of the two sisters was to create a free public waterfront park for the enjoyment of everyone. In 1940, the land was donated to Portsmouth and the park was born in 1974. It is a lovely place full of flower gardens and a water fountain and is a home to the Players’ Ring Theater. During the summer, park visitors can enjoy outdoor productions of popular Broadway plays. Just across the park is the Strawbery Banke Museum. There is also a free docking space on the Piscataqua River. Mine Falls Park is a 325-acre park in the heart of Nashua, between the Nashua River, a canal system, and the Millpond. It is one of the most vital and instantly recognizable spaces in the city and covers diverse habitats, from forest and wetlands to open fields, providing recreation for people of all ages, from walking, hiking, and biking to boating and cross-country skiing. The Nashua Canal Trail that runs through the park is one of several loop trails forming a 6-mile network of scenic trails that go along the river and canal or through the shady tunnels of old trees. Most of the trails are hard-packed dirt. Sabbaday Falls near Conway, New Hampshire, is one of the most popular waterfalls in New Hampshire. The trailhead is located next to the parking area, with a small picnic space on the bank of Sabbaday Brook with tables and benches. The hike along the brook is easy, with a soft elevation gain, and is wide and well marked. It is only 0.3 miles from the trailhead to the falls. You will hear the falls before you see them and the flow is powerful, with a lot of water, especially in the spring. The Sabbaday Brook Trail runs along the falls and the trail turns into stairs with log railings. The water falls into a deep, clear pool that is incredibly inviting, although swimming is forbidden. East and West Rattlesnake Mountains are two scenic peaks in the Lake District of New Hampshire, at the edge of the White Mountain National Forest. The peaks are fairly moderate in height and provide spectacular views of Squam Lake and the mountains all around. The Rattlesnake is crossed with a network of scenic trails that are fairly easy, even for the kids. There is not much water on the mountain, so make sure to bring enough. At the base of the mountain is the Five Finger Point Natural Area, which provides easy access to the lake. 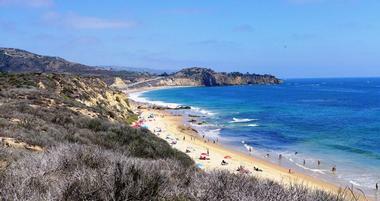 There is a hiking trail along the edge of the water and even a nice little beach. The Isles of Shoals is a group of small islands off the northeast Atlantic coast, shared between New Hampshire and Maine. Native Americans used the islands as a spring and summer fishing camp in the 1600s. 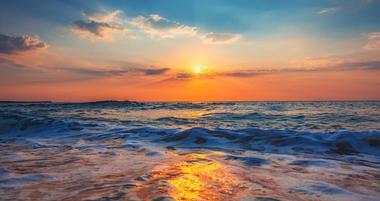 The islands were discovered and named by the English explorer Captain John Smith in 1614. There are nine islands, and four of them are in New Hampshire. The Isles of Shoals Museum, also known as the Celia Thaxter Museum, is located on Star Island. Celia was a renowned poet who lived on the islands. The easiest way to reach the islands is on the ferry from Portsmouth, which takes about an hour. There are many private tours of the islands and some combine the boat trip with a walking tour. 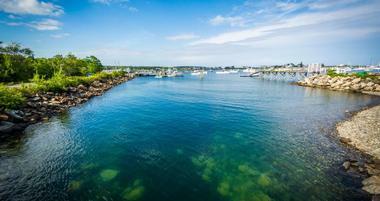 Odiorne Point State Park is a state park on the seacoast, located in Rye, not far from Portsmouth. The point is surrounded by scenic stonewalls and overlooks the ocean. The 135-acre park is a mix of rocky shoreline, fine sandy beaches, lush salt marsh, salt and freshwater ponds, dense old forest, a network of scenic hiking trails, and several historical sites. The park is a natural, beautiful backdrop for weddings and other celebrations. The Seacoast Science Center, located in the park, has permanent exhibits about the natural and human history of the seacoast area and Odiorne. Madame Sherri Forest is the 488-acre park in West Chesterfield on land donated by local resident Ann Stokes to the Society for the Preservation of New Hampshire Forests, for perpetual conservation. The forest is named for Madame Antoinette Sherri, the eccentric 1920s costume designer for the Ziegfield Follies. She had built her "castle" in the Chesterfield woods and its remains are part of the forest lore and attraction. The main trail through the forest starts near Indian Pond, running up to the ruins of the castle. As it climbs to the ledge, the trail offers wonderful views of the pond and the mountains. The Ann Stokes Loop Trail starts at the Madame Sherri Forest, running through both Madame Sherri Forest and the adjacent James O’Neil Sr. Forest. It is one of the most popular and most beautiful trails near Chesterfield. Peirce Island is the 27-acre island in the city of Portsmouth, between the Piscataqua River and the Portsmouth South End. The island is a lovely mix of tidal pools, salt marshes, rocky cliffs, and green meadows. It is a popular recreation destination for the locals and has an outdoor pool that was built in 1937, kids’ playgrounds, boat launches, and many hiking trails. The island was the site of Fort Washington, which played an important role in the War of 1812 and the Revolutionary War. The island was a shipyard in the 1800s, once had a wastewater treatment plant, and was used by commercial fishing boats for refueling.